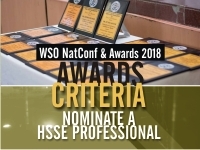 WSO NG Awards recognizes individuals and corporate entities who have excelled in various roles in the HSSE and allied fields. The World Safety Organization, National Office for Nigeria administers the awards. The awardees will be presented with distinguished plaques, among others. The awards will be bestowed during the WSO NG prestigious National Conference and Awards 2019. Download the award nomination criteria HERE. You can directly make award nominations HERE as well.